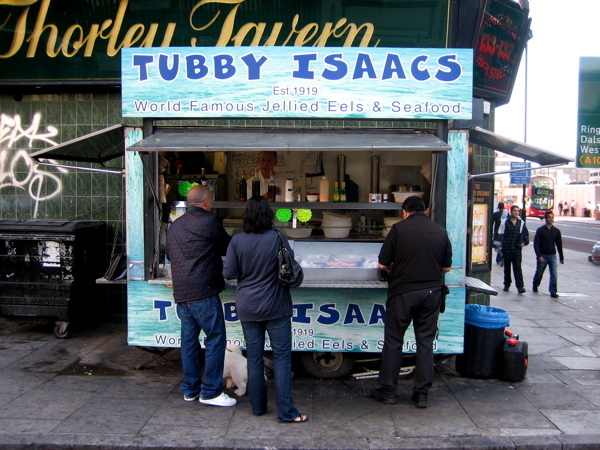 It is my sad duty to report the news that the legendary Tubby Isaac’s Jellied Eel Stall in Aldgate will close forever on Friday – ninety-four years after it opened. I am republishing my feature about Tubby Isaac’s today as a tribute, and you have until the end of the week to get down there and pay your respects by enjoying a last helping of their delicious seafood. At the furthest extent of Spitalfields where it meets Aldgate is Tubby Isaac’s Jellied Eel Stall, run today by Paul Simpson, fourth generation in this celebrated business founded in 1919, still selling the fresh seafood that was once the staple diet in this neighbourhood. Here where the traffic thunders down Aldgate High St, tucked round the corner of Goulston St, Tubby Isaac’s stall shelters from the hurly-burly. And one morning, Paul told me the story of his world-famous stall as he set up for the day, while I savoured the salty-sweet seaweed scent of the seafood and eager customers arrived to eat that famous East End delicacy, jellied eels for breakfast. Understandably, Paul takes his eels very seriously. Divulging something of the magic of the preparation of this mysterious fish, he explained that when eels are boiled, the jelly exuded during the cooking sets to create a natural preservative. “Look, it creates its own jelly!” declared Paul, holding up the huge bowl of eels to show me and letting it quiver enticingly for my pleasure. The jelly was a crucial factor before refrigeration, when a family could eat from a bowl of jellied eels and then put the dish in a cold pantry, where the jelly would reset preserving it for the next day. Paul was insistent that he only sells top-quality eels, always fresh never frozen, and after a lifetime on the stall, being particular about seafood is almost his religion. “If you sell good stuff, they will come,” he reassured me, seeing that I was now anxious about the future of his stall after what he had revealed earlier. It is a testament to Paul Simpson’s tenacity and the quality of his fish that Tubby Isaac’s lasted so long, now that this once densely populated former Jewish neighbourhood has emptied out and the culture of which jellied eels was a part has almost vanished. 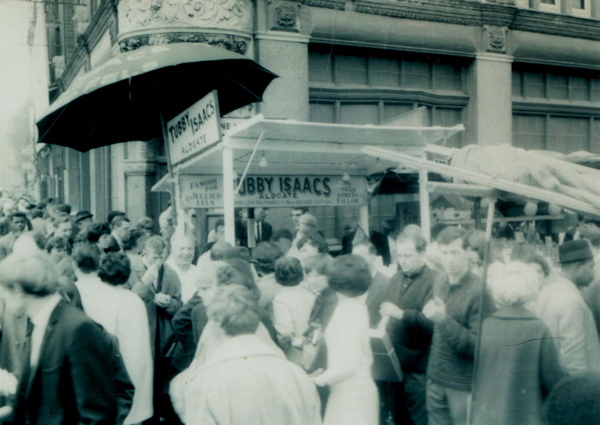 Tubby Isaac’s was a stubborn fragment of an earlier world, carrying the lively history of the society it once served now all the other jellied eels stalls in Aldgate are gone and the street is no longer full with people enjoying eels. But leaving all this aside, Paul is open until the end of this week selling delicious and healthy non-fattening food, so this is your last chance to seek him out and try it for yourself. Tubby and one of his sons in the twenties. Ted Simpson, Solly and Patsy Gritzman in the forties, after Tubby and his sons left for America. 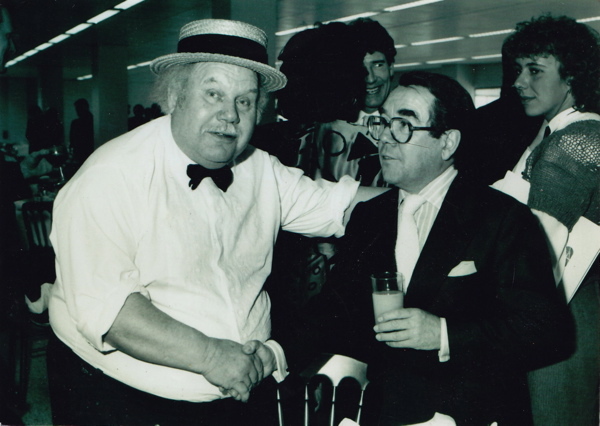 Ted shakes hands with Ronnie Corbett. Joan Rivers helped out at the stall in the eighties. Tubby Isaacs stall in Aldgate. how sad. we need a fishy fergus henderson to resurrect this e. end tradition and make eating jellied eels trendy again. and sooner than later. farewell tubby isaacs! and yes, i have eaten tubby’s eels and i would only have said: with a shot of malt vinegar and some extra fresh parsley – a bit of alright! 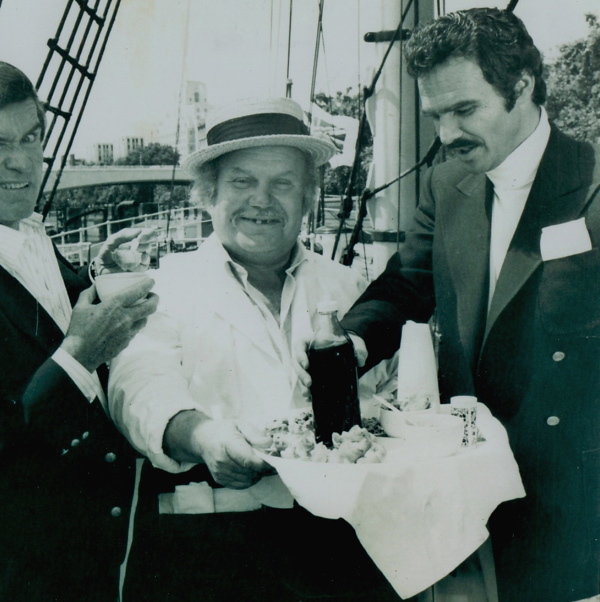 I moan the passing of a historical icon – eating jellied eels, I can do, with a healthy does of bitter, chasing it down! Will the other manifestations also vanish – because this wasn’t the only one they ran …. And why have they decided to close – more information? Please? This portrait reminded me so much of my mother, born in 1910 and raised in the east end. Jellied eels were her particular favourite and Saturday tea usually included a plate of winkles. Another beautifully evocative account of a vanishing era. I’m with Greg – I’d really like more info. Why is the stall closing? Is Isaac open to offers from people who’d take it on? We went to get some a few months ago and it was closed – must not’ve been opening hours! Now I’m even more annoyed as it seems I’ll never get to visit Unfortunately I’m not local but if we were me (and my mum!) would’ve been regulars. This is sad but inevitable I suppose. I’ll never forget being driven around (at what seemed to be reckless speed) in the early hours in a Daily Mirror delivery van, a Bedford with sliding front doors, before ending at Tubby Isaacs, which was bigger and crowded in those days. I was 12 I think. My family always had shellfish at least once a week, and I still do. 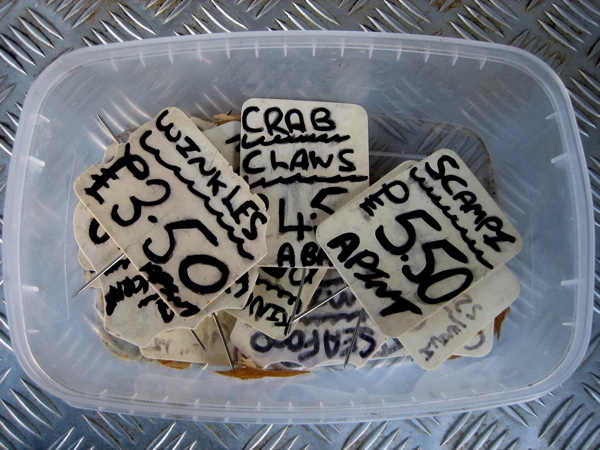 Now I get my cockles and crabs from Mick’s Eels in Downham. But food fashions change. Once many pubs had a shellfish stall outside at weekends, but while people are prepared to eat clams they shun their close relation the superior cockle. Very sad, I was brought up not too far from the stall and we would often stop off on the way home from the West End. Another piece of the East End going! Thank you for documenting these things, without The Gentle Author our kids might never know. It might not be entirely over. If he can pass the trailer and name on to another proprietor and the council let them keep the pitch, there may well be eels on Goulston Street in the future. At present they’ve said there’s a waiting list for that pitch. I find it very hard to believe. Watch that 6ft by 3ft space. Ellie. Yes. He is open to offers! Sad news. Wish I could say goodbye. How very sad. Strangely enough my wife and I bought some of his cockles and herring exactly a week ago. It was our very first visit to Tubby’s and sadly looks to be our last. At the time we didn’t realise that he was about to close for good. The food was delicious, and we enjoyed eating it in the warm sunshine in the local park on Whitechapel Road! Such sad news. I will be down there tomorrow to buy up some prawns etc and to wave goodbye to such a landmark of the east end. 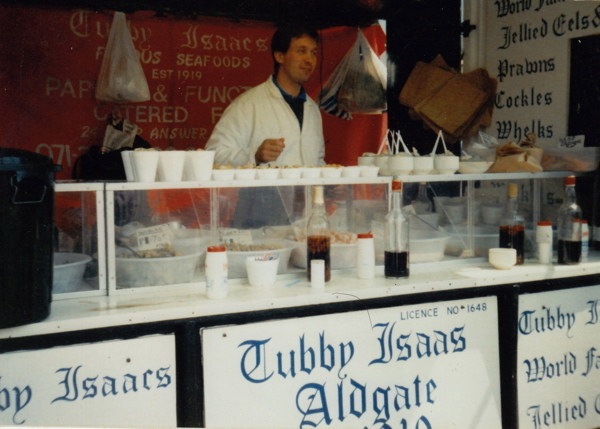 Reading your article brought back some wonderful old memories of Tubby Isaacs and the tasty jellied eels I used to enjoy at his stall after a night out. I can still taste the eels and the malt vinegar. I have lived in Antipodes for nearly 40 years however on my rare visits to the UK I would hot foot it to Tubby Isaacs for my fix. I am very sad to hear of the business closing down, another bit of East End history to disappear. My father was a fishmonger and when I was a small child I used to play with the eels in my pram outside his shop. I wish the owners well in their retirement. Thanks for the memories and delicious eels. A very sad day indeed! a very sad day today! 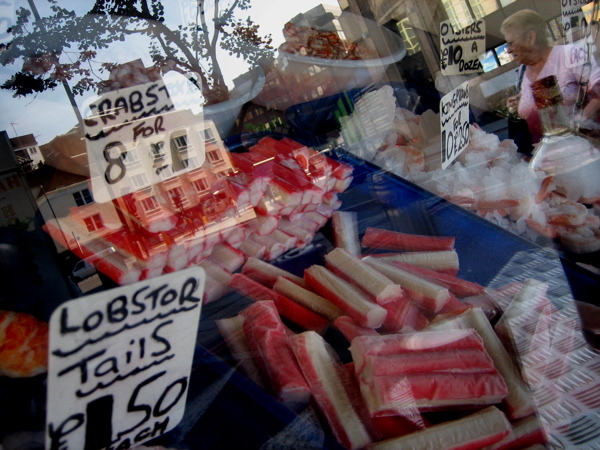 ive been going to the stall for over 30 years and I always used to get there early on a sunday morning for my sea food mix and eels.i remember when the pub next door would open at 9 am on a sunday and I would go and get paul a quick half of guiness.anywayall the best paul! Thank you for all your lovely comments. Its a very sad day. A sign of the times! Talked with a 93 years old lady today, who sings to us all the East End songs she remembers and gosh, did songs have long lyrics! I told her that Tubby Isaacs was no more as from yesterday. She had know it since she was a child going to school in Algate, then working in Middlesex street for a great part of her life. Her mate could never understand how she could eat jellied eels on her way back from work. So one day, she bought some and took it to her friend’s house, summonned the two brothers and asked them to at least try it once, please. They were converted with the first mouthful. Then her mate dared try them as well and from that day onwards, they both would order and eat jellied eels on their way home. If this was any other great city like NYC or Paris somebody would have bailed them out & relocated this stall in a better area… it is essentially a ‘household name’, an important cultural & historical landmark in London… it should have been moved to Spitalfields & brought up to date… with some outside space, tables, a bigger selection of food and a drinks license etc… this stall’s history should be cherished & maintained, instead it’s going to be forgotten… like all the pie & mash shops being swallowed up by Starbucks, Costa & McDonalds… a terrible shame. 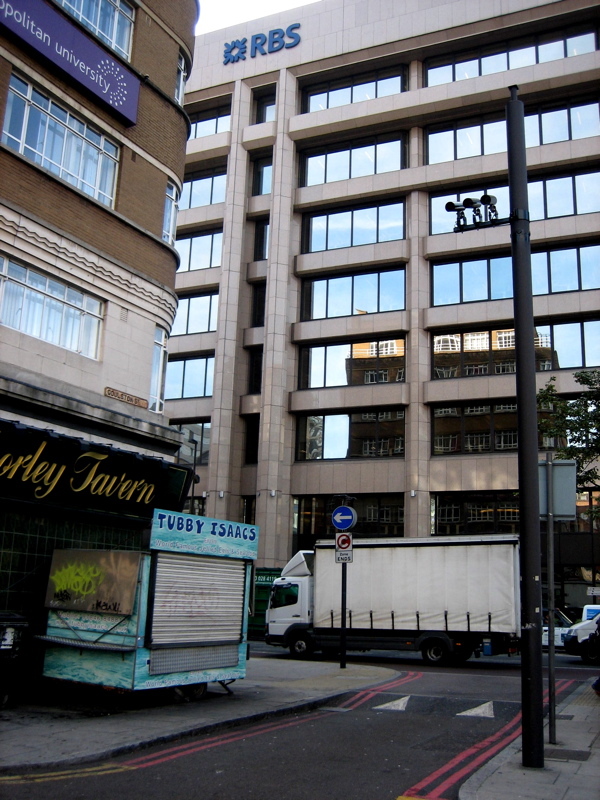 Just seen the news about Tubbys stall was born and lived for years in Aldgate. A real coincidence for me to find this page today. How sad, the news. Visited it a couple of years ago. 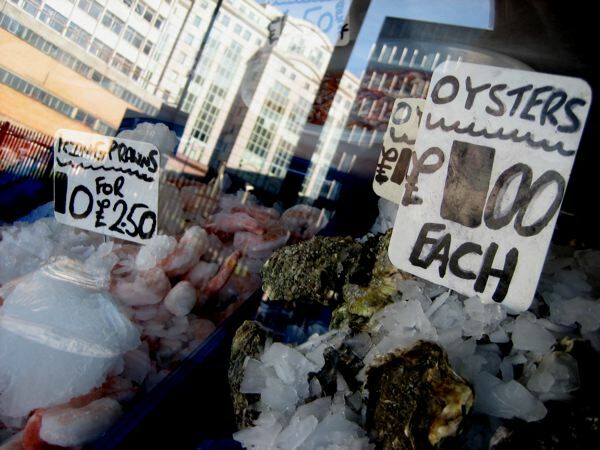 , sea food prices have now reached astonishing levels, in WAITROSE cockles are now £22.99 a kilo recently in southend i was charged £6 for a pint of whelks, and in a fish and chip restaurant in islington half a pint of prawns in a half pint beer mug was £8 pounds. Such a shame the stall closed down, used to go here almost daily at lunch until I bought my own home and had to start being smart with money. I never quite got into the eels, however Paul’s other products were all top notch. The fresh mussels melted in your mouth. I’ll miss that taste. Paul…thanks for the banter, summer “spotting” and top notch grub. It’s a segment of my life that I’ll no doubt tell my kids about when I grow old. 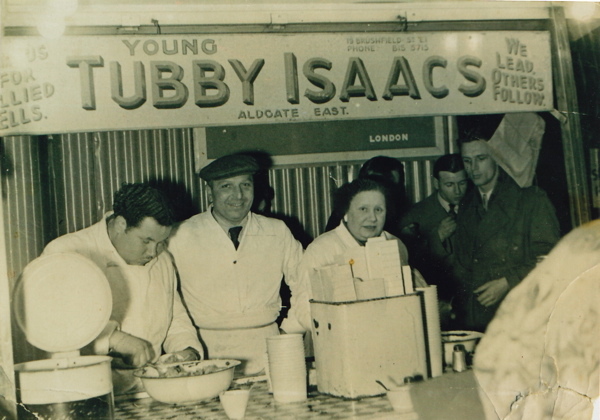 I have been enjoying eating Tubby Isaacs delicious jellied eels and all the other great seafood dishes at his stall over the last fifty three years. What a sad loss that such an iconic stall that has given many a gastronomical feast should have to close down, a sad sad day. Paul I wish you all the luck for the future. a staple diet when visiting grand parents in shadwell & limehouse & me dad worked on the island. carried on visiting when having a glass or two of beer in the east end. sadly, as the pubs starting closing down my visits stopped. good luck & god bless. What a terrible shame, an end of an era. I had a shop opposite Tubby’s for years and used it weekly. Its an East End landmark and shouldnt have been allowed to close. Deserves a blue plaque imo. I HAVE A LOT OF ISAACS IN MY FAMLY THAT I AM TRACING BACK. Another tradition gone, there will be nothing left soon of our rich past. 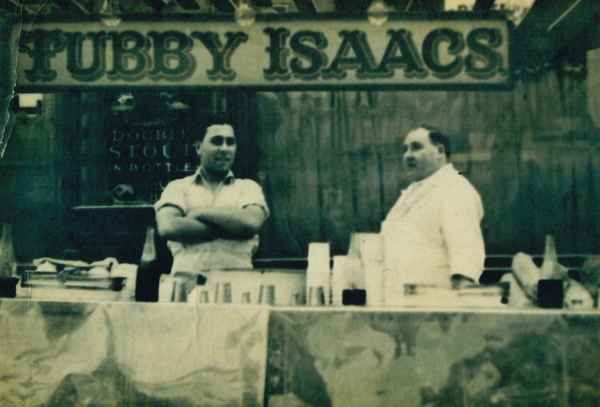 The business was founded in 1919 by ‘Tubby’ Isaac Brenner, In 1920 Solly Gritzman began working with Tubby on the stall at the age of 11. 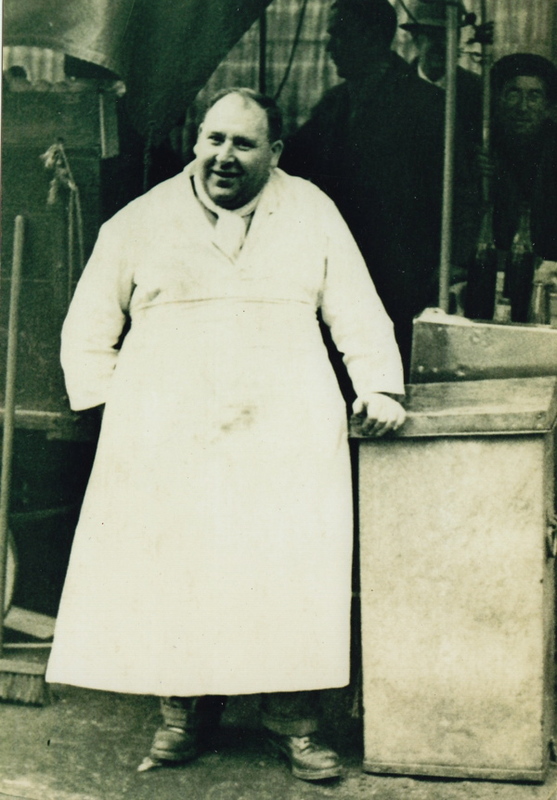 When Tubby emigrated to USA, just before the Second World War, Solly took over the business. Solly died in 1982 and the business was taken over by his nephew Ted Simpson. 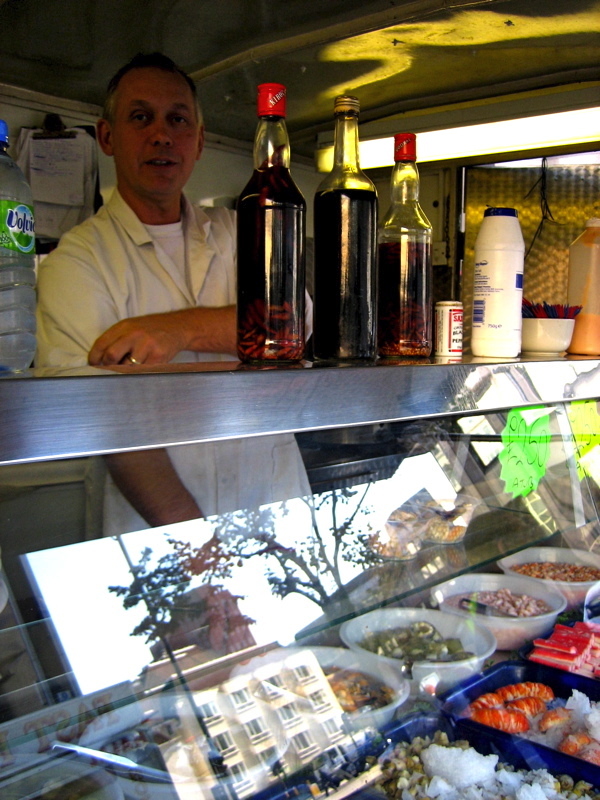 Ted’s son Paul started working on the stall in 1989. Sadly the stall closed down in June 2013.